Cecil Calvert, 2nd Baron Baltimore (8 August 1605 – 30 November 1675), was an English nobleman who was the first Proprietor of the Province of Maryland, ninth Proprietary Governor of the Colony of Newfoundland and second of the colony of Province of Avalon to its southeast. His title was "First Lord Proprietary, Earl Palatine of the Provinces of Maryland and Avalon in America". He received the proprietorship after the death of his father, George Calvert, 1st Baron Baltimore, (1579 – 15 April 1632), for whom it had been intended. 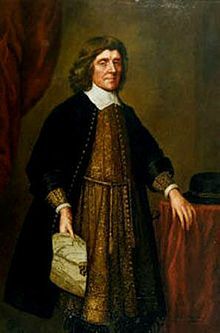 Cecil Calvert established and managed the Province of Maryland from his home, Kiplin Hall, in North Yorkshire, England. As an English Roman Catholic, he continued the legacy of his father by promoting religious tolerance in the colony. Calvert entered Trinity College at the University of Oxford in 1621. His mother Anne Mynne (or Mayne) died the following year. His father George Calvert, 1st Baron Baltimore, converted to Roman Catholicism in 1625, and it is likely that his children followed him; at least his sons did. Calvert received a Charter from King Charles I for the new colony of Maryland, to be named for the Queen Consort Henrietta Maria (wife of King Charles I). This was shortly after the death of his father, the First Baron Baltimore, who had long sought the charter to found a colony in the mid-Atlantic area to serve as a refuge for English Roman Catholics. The original grant would have included the western shore of the Chesapeake Bay as far south as the Potomac River and the entirety of the eastern shore (future " Delmarva" peninsula). When the Crown realised that settlers from Virginia had already crossed the bay to begin settling the southern tip of their eastern shore, the grant was revised to include the eastern shore only as far south as a line drawn east from the mouth of the Potomac River (including the future State of Delaware). Once that alteration was made, the final charter was confirmed on 20 June 1632. This charter would be heavily contested by Calvert's heirs and the Penn family in the Penn–Calvert Boundary Dispute. Modern reconstruction of " Dove", one of the two ships that carried settlers to plant Lord Baltimore's first settlement in Maryland in 1634. Calvert attempted to stay closely involved in the governance of the colony, though he never visited it. 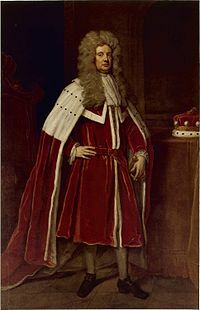 During his long tenure, he governed through deputies: the first was his younger brother Leonard Calvert (1606–1647),  and the last was his only son Charles. In 1649, Maryland passed the Maryland Toleration Act, also known as the "Act Concerning Religion", mandating religious tolerance for Trinitarian Christians only (those who profess faith in the " Holy Trinity" – Father, Son and Holy Spirit, excluding Nontrinitarian faiths). Passed on 21 September 1649, by the General Assembly of the Maryland colony, it was the first law establishing religious tolerance in the British North American colonies. The Calvert family sought enactment of the law to protect Catholic settlers and Nonconformist Protestants who did not conform to the established Church of England. Cecil Calvert died in Middlesex, England on 30 November 1675. He was succeeded by his son and heir, Charles. A 1908 statue of Cecil Calvert stands on the steps at the west entrance of the Circuit Courthouse of Baltimore City (built 1896–1900 – renamed the Clarence M. Mitchell, Jr. Courthouse in the 1980s) facing Saint Paul Street and a small Court Plaza with a fountain. It is the site of annual " Maryland Day" (25 March) ceremonies which continue inside the elaborate lobby and ceremonial courtrooms. ^ "Person Page". thepeerage.com. Retrieved 5 April 2018. ^ Harding, Vanessa (1993). " Burial of the plague dead in early modern London" (Centre for Metropolitan History Working Papers Series, No. 1, 1993). ^ a b Richardson, Douglas (2005). Magna Carta Ancestry: A Study in Colonial and Medieval Families, p. 169. Baltimore: Genealogical Publishing Company. ISBN 0-8063-1759-0. ^ a b Krugler, John D. (2004). English and Catholic: the Lords Baltimore in the Seventeenth Century. Baltimore: Johns Hopkins University Press. ISBN 0-8018-7963-9, p. 32. ^ "Leonard Calvert MSA SC 3520-198". Maryland State Archives. 7 March 2003. 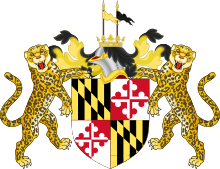 ^ Several versions to represent the Colony and the State had been used since the grant to the Second Lord Baltimore. 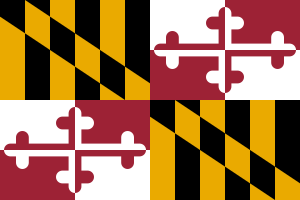 For more information see: Flag of Maryland. ^ a b Maryland Manual Online: A Guide to Maryland Government, Maryland State Archives, 30 October 2012. Maryland at a Glance: State Symbols.